As I mentioned the Robert Henri book I am reading I thought I would post an educational study I did in March of one of his paintings along with the original - see if you can work out which is which, ha! I wasnt familiar with his work previously and am still not sure about some of his faces but it was a nice study to do and it seems he was a hugely influential teacher and important artist of his time. My study was done in faux life painting conditions to help me find a method of painting quickly with a real model and although that didnt quite work out, it was edited and revised quite a bit, I was quite pleased with the result. I had a spare frame from a failed charcoal portrait so I thought I would use it, I quite like to glaze oils when they are on canvas board and its the nearest I will ever get to having a masterpiece on my wall! 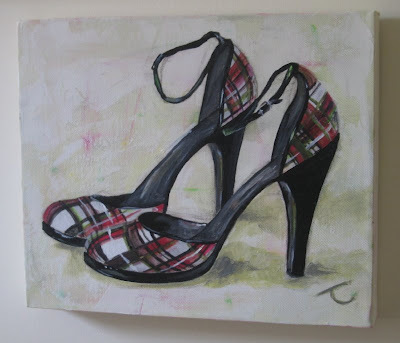 Oil on Canvas panel 16 x 12"
I think I have had enough of shoes for a while. These quick studies served their purpose as painting from life practice but I think if I revisit the subject I would like to do so in a more meaningful way with more planning and composition. Perhaps a winter setting. It was good to use acrylics again after only using oils for a while as I plan to give them a go in my next life painting figure workshop. My thinking is that the difficultly in blending acrylics might be a good discipline and help me paint more cleanly and decisively in a live situation - also its a real nuisance transporting wet oils around. Acrylic on Canvas 10 x 12"